Backyard Aquaponics • View topic - Submerged outlet for bell siphon? Submerged outlet for bell siphon? Post subject: Submerged outlet for bell siphon? I am working on a redesign for my small system, converting to a CHIFT PIST. See below. Pencil is existing: blue pen is proposed tie in to existing (replacing timed flood and drain with a bell siphon). Maximum water surface elevation in the sump is approximately the same as bottom of the grow bed. FT will empty directly into the GB. GB will have a new bell siphon, following Mr Damage and University of Hawaii guidelines (1.5" dia. stand pipe with 3 or 4" diameter bell). Almost everything I have found online shows the bell siphon emptying to open air. In order to maintain adequate water volume, I will have to drain into an existing closed loop. The below thread seems to indicate that I can do this, provided I have a snorkel at the outlet. 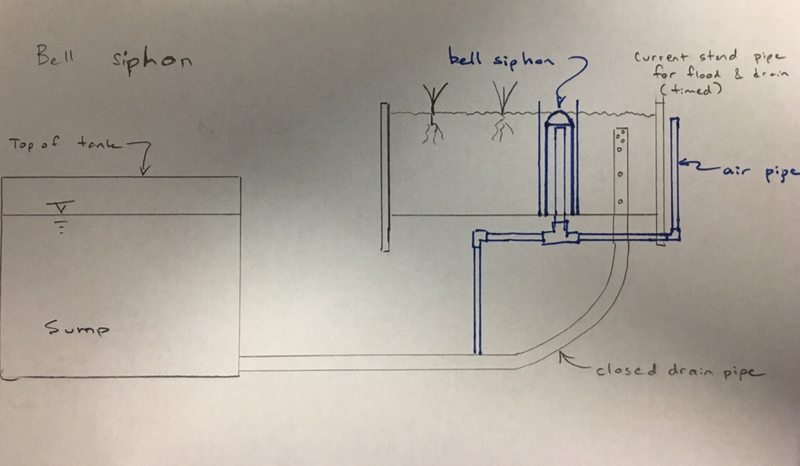 Post subject: Re: Submerged outlet for bell siphon? Make sure the snorkel is supported and secure . Not too late - I've been overwhelmed with work and unable to do more than feed the fish and pull a head of lettuce every day or two. With current FT position, maximum water level is about even with bottom of GB. The current FT will be converted to sump in my more recent design, and it looks like I need to try to bury it at least a few inches. Thanks for the advice!